Think chicken with coconut milk and you’ll think the recipe I’m sharing today is inspired by cuisine in Kerala. I wouldn’t be surprised if someone told me that the original recipe travelled from the lush green landscape of Kerala to the homes tucked in the bylanes of Kolkata, cooked for the first time by an enterprising traveller who had returned home laden with experience and recipes. The first I read about this Bengali style of cooking chicken in coconut milk was within the pages of a Bengali book printed ages ago. It took me a while to decipher the Bengali script – I am not yet fluent in reading the same – but I was impressed by the simplicity of this dish. What suited me best was the departure from the heavy hand with spices, opting for the subtle taste of rich coconut milk enhanced by a minimal number of spices. The thought that this would be a perfect dish for a special meal any time of a summer day was further confirmed when the parents gave it thumbs up. “The chicken is so soft and the gravy so tasty and light, I am not worried about falling ill after indulging myself,” said my father, beaming after tucking into the narkel malai murg for lunch. His words prompted me to think about sharing this recipe on From The Corner Table for the Poila Boishakh meal series. ‘Poila Boishakh’ or ‘First of Boishakh’ is the the first day of the first month (Boishakh) in the lunisolar Bengali Calendar. Celebrated as the beginning of a New Year by Bengalis worldwide, the day falls on the 14th or 15th of April in the Gregorian Calendar. It is one among the many New Year celebrations marked by other communities and states – Punjabis celebrate Vaisakhi on April 14, Tamil Nadu steps into their New Year on April 14, Assamese mark the beginning of Bohag Bihu on April 15 while people of Kerala observe Vishu on April 15. Grab a copy of the ponjika (the Bengali calendar) on Amazon (click here). 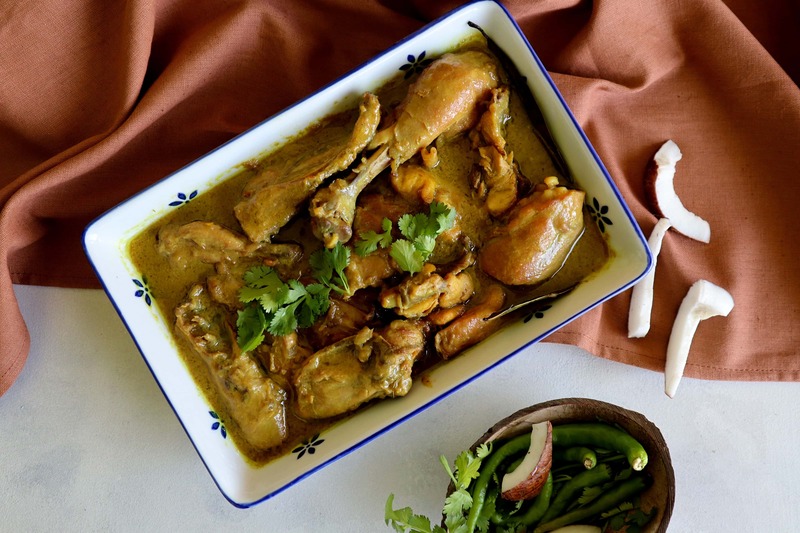 A departure from the traditional maangsho jhol that is an all-time favourite but rather rich because of the use of a large amount of spice, the narkel malai murg (coconut milk chicken) is subtle and delicate in flavours. And the best part about cooking it is that you don’t need to be standing at the kitchen stove to slave over it! Since the curry is to be cooked on low flame, you can go about doing your work as the chicken simmers, popping in to give the curry a quick stir occasionally. This recipe asks for two types of coconut milk – thick and thin. Traditionally – and ideally – this dish should be made with fresh coconut milk. That being a distant possibility in the absence of fresh coconut and lack of time, I opted for readily available options of coconut milk. For the thick coconut milk that is used later in the recipe, I used the coconut milk from Dabur Homemade series (buy on Amazon). The thin coconut milk required to cook the chicken was made by diluting Maggi Coconut Milk Powder (buy on Amazon) in warm water. Being made mostly of coconut milk, the gravy will thicken as it starts to cool. If you feel the chicken is cooked through and there is too much gravy, mix in a teaspoon of rice flour into the gravy – this will thicken your gravy without changing the taste. So here’s presenting to you the main course of the Poila Boishakh meal – the narkel malai murg. For the first course of the meal, read the previous post Sweet Ghee Rice | Mishti Ghee Bhaat check share your thoughts about the post and making this recipe – you can connect with me through the comment section below; via email cornertabletales@gmail.com; on Facebook (click here); at Instagram (click here); with Pinterest (click here). To get the recipe of the third course from the Poila Boishakh meal series in your inbox, subscribe to From The Corner Table. Chicken cooked in coconut milk with minimal spices. Heat ghee in a wok or kadhai till warm. Add the bay leaves and fry till they are fragrant and spluttering. Next, add the sliced onions and fry till soft and golden brown. Cooking on low flame, add the chilli and garlic pastes. Cook for 2-3 minutes. Add the chicken pieces to this mixture along with a teaspoon of salt. Mix well and let the chicken cook in the spice paste and its own juices. Stir occasionally, cooking till the chicken has stopped releasing juices and the spice paste is secreting oil. Add a cup of coconut milk, half a cup of warm water, green chillies, turmeric powder, salt and sugar to the chicken. Allow it to simmer until the chicken is cooked through. Pour in another cup of coconut milk, adjust the seasoning and cook for 10 minutes or until the curry has reduced by half. Remove from flame, garnish with coriander leaves. Serve with Indian bread of choice, steamed rice or mishti ghee bhaat.